Late last year, several employees of the Haryana Health Department filed a legal challenge as a result of receiving transfer orders to work at different health facilities. The plaintiffs claimed they had been wrongly transferred due to record-keeping mistakes. A subsequent judicial review uncovered numerous clerical errors in the state’s 25,000 employee records, including employees with identical names being misidentified. To avoid future litigation, the high court ordered in February that each employee must receive a unique identification number within the next six months. 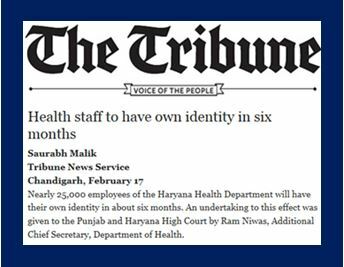 Before this legal challenge, however, the Haryana Government, with technical support from USAID’s Health Finance and Governance project (HFG), had already been working on a solution: implementing a new Human Resources Information System (HRIS) to give all of its doctors, nurses, and other health care staff a unique identification numbers. Before the HRIS was developed, Haryana’s health worker personnel records were kept on paper. The logistical challenge of maintaining thousands of paper records likely contributed to the clerical errors cited in the lawsuit. The paper-based system also made it difficult for state officials to make evidence-based decisions on HRH policy and management. Haryana first established the online HRIS system with assistance from USAID’s CapacityPlus Project and has moved forward with support from HFG. The HRIS should give administrators with the data they need to manage their large health workforce. The effort to tackle a project of such a large scope‒designing and launching the software, as well as entering and validating the data‒has been a multi-partner, multi-year task. Last year, HFG accompanied a state-level technical working group to conduct a system requirements study, which recommended the state should map the entire health workforce using the HRIS. The workforce is comprised of approximately 17,000 regular workers and 3,000 contractual workers. The new system will allow for a better management of a workforce of more than 30,000 health workers and improve processes related to recruitment and retirement planning and overall management of contract and regular staff. In the longer term, it is likely that a well-functioning HRIS will yield additional benefits for Haryana. For example, data validation may lead to the identification of “ghost workers,” employees who are absent from their posts or non-existent, which could result in significant cost savings for the state. Confirmation of vacancies could also allow the state to hire or transfer employees to facilities in need of additional staff. Whatever the state’s health system goals in the future, an effective HRIS will empower its decision-makers to take evidence-based actions to optimize the use of its human resources.